I picked up my Box S (98K miles) on Monday. Took it to the local Porsche Indie to fix a few things (clutch, IMS, turn signal, etc.). Turns out the engine was replaced under warranty with something newer and bigger; a 2006 or 2007 motor. I'll have to do some digging to find out who, where, when and what. So, no new IMS bearing for me. The rest of the car is really nice, no issues. Pix follow. Sweet, Dave! Congrats and welcome. I've owned a lot of sports cars over the years, the most recent being a supercharged, lowered Miata. The Box is a quicker, smother ride, and handles the tight twisties as well as the MX-5. Now that I've used a tank of gas in the Porsche, it appears the gas mileage is the same; around 20 MPG in mixed city/highway. One thing I haven't figured out: Do you really have to lock the car to get the dash info and cabin lights to turn off? Is there a timer that will shut everything off automatically after 5 minutes or something? Very nice, welcome to the forum! 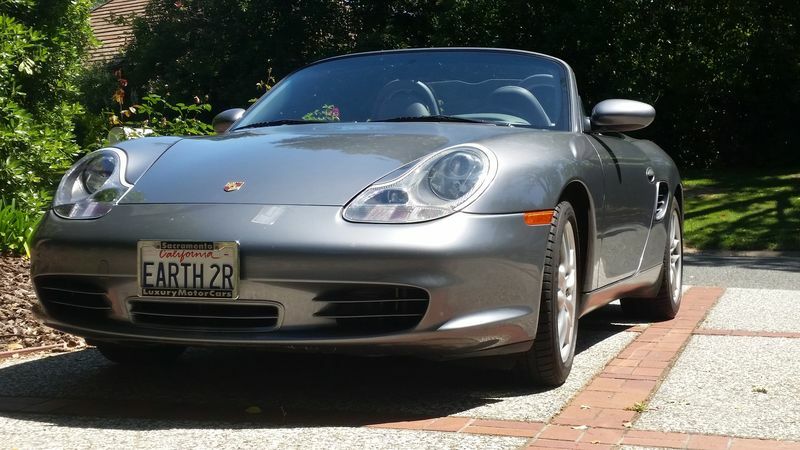 Congrats on a nice Boxster and welcome Yes, the dash info and lights should eventually go out. Dave, yes, the dash and lights will turn off after a short while. Have fun with the car. I certainly do! Thanks for the warm welcome and info, everybody!